As if a 125th anniversary weren’t monumental enough, a new dinosaur is moving into the Field Museum—a titanosauric one. Cast of Patagotitan mayorum, the Field’s new specimen is a giant, long-necked Titanosaur from Argentina, aptly named Maximo. From snout to tail, it stretches 122 feet (in case you need visuals, that’s longer than two accordion CTA buses end-to-end—and about the length of 25 Danny DeVitos). Maximo isn&apos;t the only new addition to the Field&apos;s emblematic Stanley Field Hall. He&apos;ll be joined by a flock of pterosaur (flying reptile) replicas, as well as state-of-the-art hanging gardens to mark the institution&apos;s 125th anniversary. 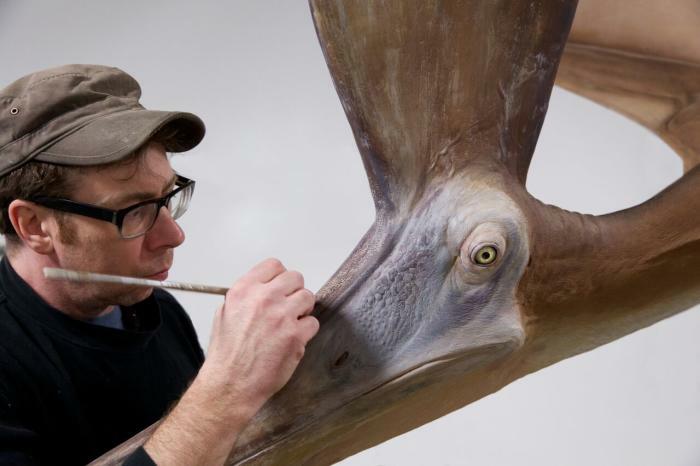 The pterosaur replicas include nine hawk-sized Rhamphorhynchus (ram-foh-RINK-us), two Pteranodon (teh-RAN-oh-don) with 18-foot wingspans, and two giant Quetzalcoatlus (ket-zal-co-AHT-lus), whose wings span a staggering 35 feet. When’s it all happening? Excitingly soon — over the next few months, in fact. 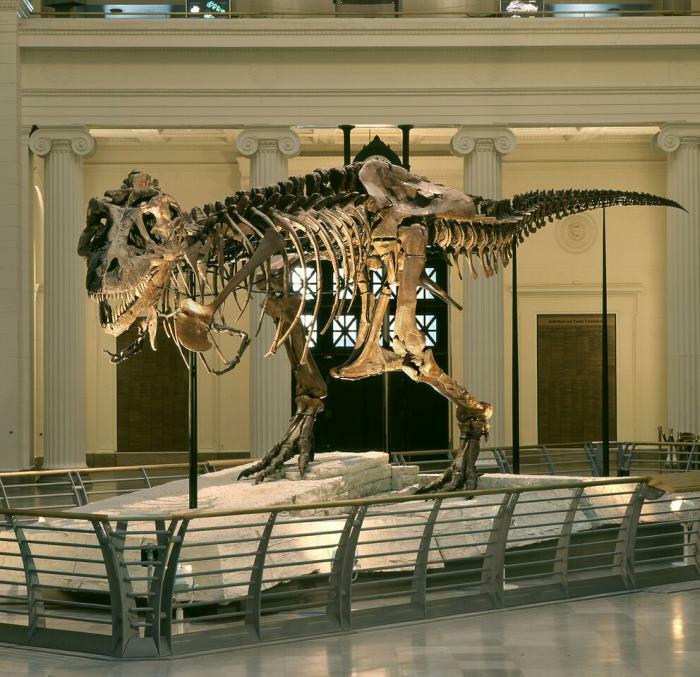 However, lovers of the Museum’s iconic SUE the T. rex might be a little weepy to hear she’ll be moving from the main Hall to a new 5,800-square-foot gallery space as part of the Evolving Planet exhibit to make room for her new housemate. Fortunately, SUE doesn’t feel bad about it at all. In an official press release, SUE (reachable on Twitter @SUEtheTrex), explained that, “For years now, I&apos;ve been pitching this to the Museum. A room with a better defensible position against velociraptor attacks and reduced exposure to possible meteorite collisions. Finally, the mammals in charge have come to their senses." Visitors will witness SUE’s deinstallation beginning February 5, and throughout the month, with her reappearance scheduled for February 2019. What’s more, beginning in May, you’ll get a close-up-and-personal look at Titanosaur’s installation, which is estimated to take less than a month. Dinosaurs are notorious social media hogs, which means Maximo is super happy about becoming the Field’s new selfie darling. Visitors will be able to touch the cast, walk underneath it and grab an eye-to-eye glimpse from the second-floor balcony (yes, Maximo really is that tall). Some of its real bones also will be on display, including a whopping 8-foot-long thighbone. In the meantime, SUE will be getting a bit of a spa makeover in the “gastralia” department. The gastralia are a set of bones that look like an additional set of ribs stretched across T. rex’s belly. To date, SUE’s gastralia haven’t been attached to the rest of her skeleton. That’s because gastralia are rarely preserved in Tyrannosaurs, and scientists weren’t quite sure how to position them when the skeleton was first mounted in 2000. Ongoing research now gives a clearer picture of where SUE’s gastralia belong and their function in facilitating breathing. She’ll also get a little of the “This is Your Life” treatment. The new exhibition space will tell SUE’s story in detail, including fossils discovered alongside her that illustrate the world in which this T. rex lived, cutting-edge multimedia technology, and digital interactives. Goodbye SUE! But not for very long. 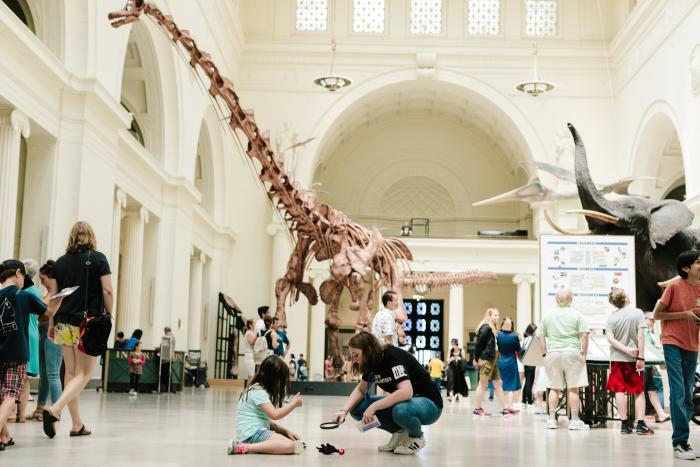 The Field Museum is located at 1400 S Lake Shore Dr, and is part of Chicago’s Museum Campus (also comprising the Shedd Aquarium and Adler Planetarium). The Museum is open 9am-5pm daily except Christmas, with last admission at 4pm. Admission: Adults $36, Students $31, Children aged 3-11 $25, Seniors $31. Call (312) 922-9410 for more information, or visit fieldmuseum.org.